Priceline outlasted Expedia in the room-night growth arms race, posting 32% growth to Expedia’s 24%. Although there was a slight dent in the armor, as Priceline room-night growth was slightly faster a year earlier. The Priceline Group outpaced Expedia Inc. with a 32% year over year growth in room nights in the first quarter of 2014, compared with 24% at Expedia. However, Priceline’s room night growth decelerated from the first quarter of 2013, when it increased, 37.7%. For the first quarter, Priceline notched a 35.6% increase in net income to $331.2 million on $1.64 billion in revenue, a 26% jump. 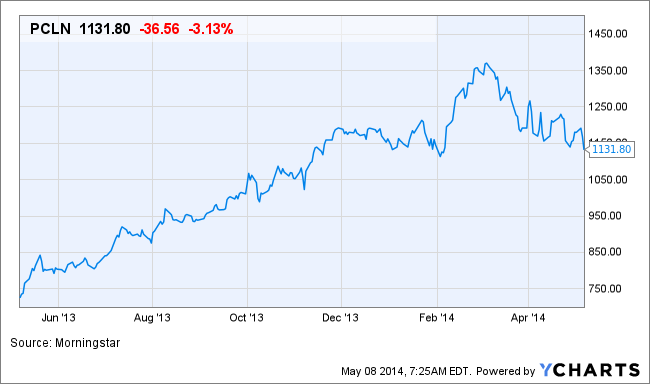 Gross bookings for Priceline during the quarter came in a $12.3 billion, a 34% year over year increase. In contrast, Expedia Inc. notched a 24% jump in room-night growth in the first quarter of 2014, decelerating from the 28% growth it recorded a year earlier, but gross bookings rose 29% as Expedia’s Travelocity partnership bumped up air ticket sales. Room nights for another publicly traded online travel company, Orbitz Worldwide, grew at a 12% pace in the first quarter, down from the 14% growth it posted a year earlier. Orbitz Worldwide saw its gross bookings rise just 3% to $3.2 billion in the first quarter. Priceline beat revenue estimates with the analysts looking for 25.3% year over year increases to $1.63 billion.